Several achievements from 2017 are helping our Zieggy Tribe jump into this new year closer to reaching our goals for 2018. Some of those achievements are listed below with a brief explanation to put this progress into perspective. In 2017, employee retention numbers increased across all Ziegenfelder facilities. This allows The Ziegenfelder Company to expand our Zieggy Tribe in 2018 with new hires while providing more opportunities for our current Zieggy Tribe members. An additional line is already scheduled to begin running at the plant in Wheeling soon giving The Zieggy Tribe the ability to provide more products to our customers. The Ziegenfelder Company started devoting more resources to developing automation technology at its plants in 2017. In 2018, the first automation project will be tested and implemented at the Denver facility. This will require more specialized training for current Zieggy Tribe members and possibly lead to more expansion of our Zieggy Tribe. In 2017, Zieggy Tribe members in Chino exceeded expectations related to efficiency numbers. The group came together to have an incredible year and support the entire company by producing an overwhelming number of cases. The Tribe in Chino be going into 2018 with the momentum gained in 2017. All of these achievements are possible because every member of our Zieggy Tribe helps the person to their left and to their right each day. 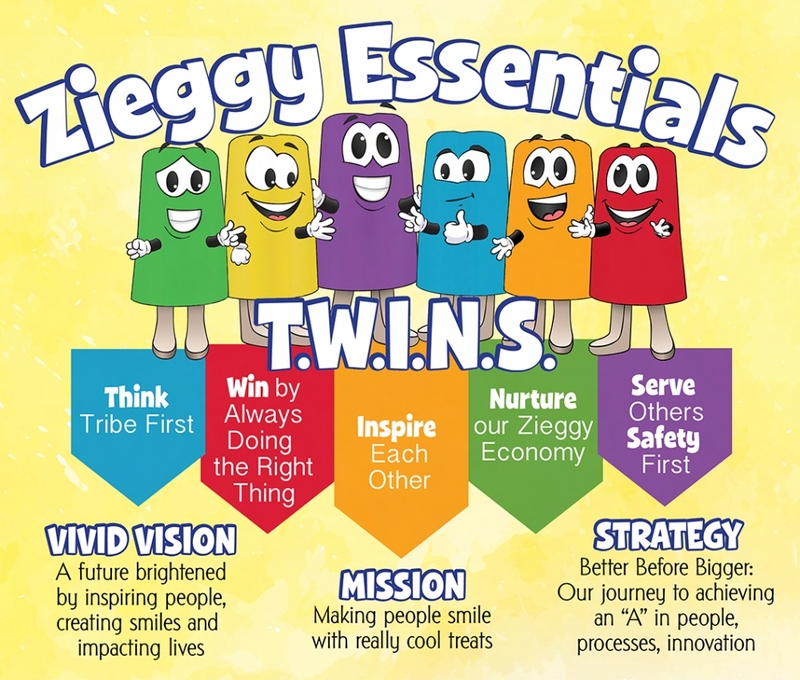 Zieggy Tribe, THANK YOU for staying true to the core values outlined in the Zieggy Essentials. It made a difference in 2017 and your efforts will continue to make people smile with our really cool treats in 2018. Check out some of these comments from members of our Zieggy Tribe provided to us through the 2017 Zieggy Tribe Survey.